We are very fortunate because we have a gas burner barbecue (bbq) in the back yard. This means we can have barbecued food as and when we like. The thing is however, even though my husband encourages me to use the bbq, I am petrified of the machine and I have never used it to cook anything. Having said that, I really like bbq ribs. And being a prudent home cook, I detest spending loads of money on ribs in restaurants when I know I can make ribs that taste just as good (if not better) at home for a fraction of the price. And with very little fuss too. This is because I took the easy way out and cooked them using a slow cooker. A slow cooker is a wonderful appliance to have at home. My friend, Yvonne, makes the most amazing stews using her slow cooker. I use my slow cooker to cook anything from soups to (American) chilies, to, well, ribs. My preferred way to prep the ribs is to make a dry rub for them. Into a bowl, I added paprika (I prefer smoked paprika), brown sugar, cayenne pepper, salt, pepper, garlic and onion powder. Using a whisk, I mixed everything together. I rubbed this onto all sides of the ribs. After which I transferred the ribs into an air-tight container. This was placed in the fridge over night for the flavours to mingle. About 3-4 hours before dinner time (depending on how fast your slow cooker cooks), I placed the ribs in the slow cooker, added the bbq sauce, covered the ribs with a piece of parchment paper, closed the lid, and left the ribs to cook for 3 to 3.5 hours. When the meat was really tender (I poked at it with the tip of a knife to check), I transferred the ribs (very carefully) onto a lined and lightly greased baking tray. Using a brush, I slathered on a little more bbq sauce. Then I placed the baking tray in the oven and grilled the ribs at high heat for about 10-15 minutes. Once the edges started to caramelize, the ribs were ready. This won't take very long, so hang around the kitchen and keep an eye on the ribs. Try making this for your family. I guarantee there would not be any left overs. And unless you choose to tell them how they were made, everyone would think you'd spent ages cooking these fall-off-the-bones and super tasty ribs. 1. 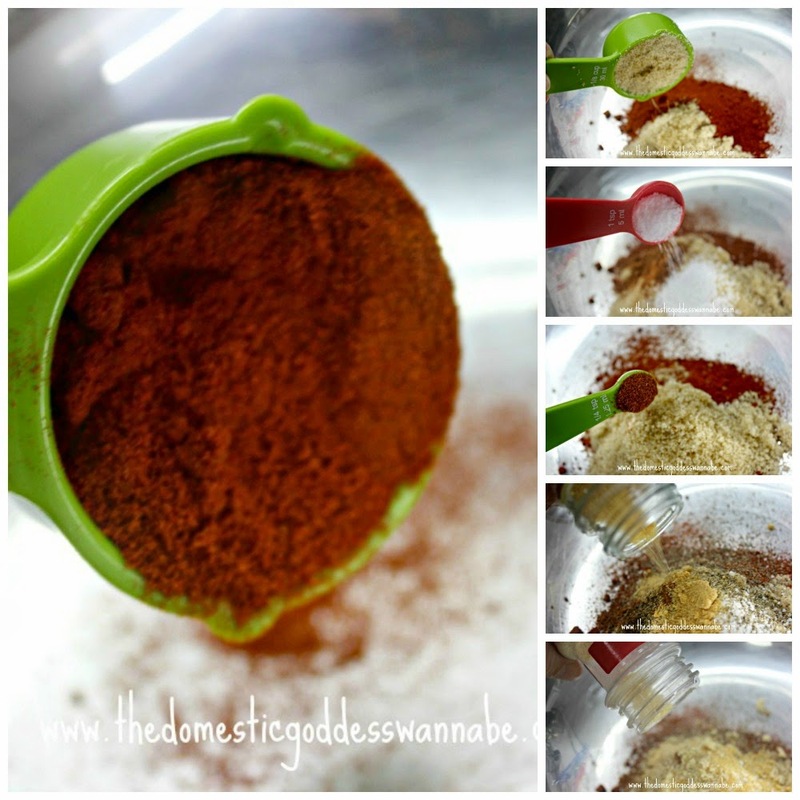 In a small bowl, combine paprika, brown sugar, cayenne pepper, salt, pepper, garlic and onion powder to make dry rub. 2. Liberally rub spice mixture on all sides of ribs. 3. Prop ribs into slow cooker against the sides and leaning in like a tent. It doesn't need to be perfect, just propped up so there can be a bit of air around the ribs. 4. Pour the barbecue sauce over the ribs. Place a piece of parchment paper over the ribs, then cover with the lid. 5. Cook in slow cooker on high for 3-4 hours or until ribs are cooked through and falling off the bone. 6. Preheat broiler. Carefully transfer tender ribs to a broiler pan. Set aside. 7. Pour sauce and drippings from slow cooker through a sieve into a medium sauce pan. Heat on high until boiling, reduce heat and simmer for 10-15 minutes until thick and syrupy. - I simply poured more bbq sauce onto the ribs and brushed to coat evenly. 8. Brush sauce on ribs and place under broiler for 10 minutes or until caramelized. - I grilled mine at 220C for 10-15 minutes. 9. Serve with more sauce on the side, if desired. I love ribs! Thanks for sharing the recipe.